The waste ink absorber consists of two foam pads within a rubber frame, the foam absorbs the mess and prevents the loose particles from falling to the floor of the machine. Eventually, though, the waste absorber gets full and needs to be emptied and cleaned. You will know when this time comes as an error message will be triggered and the printer will not print. This error is either displayed as “Waste Ink Tank Full” or “The Ink Absorber is Full” in the software or on the control panel, or a sequence of flashes from the printer’s indicator lights will indicate this error when you consult the manual. Lift the plastic lid to reveal the internal components of the machine. Be sure to wait a few seconds while the ink carriage automatically slides out of the way. Locate the black rubber frame that holds the dual absorber pads and pull it until you feel it detach from the machine. Once it detaches, pull the assembly slightly to the left and then lift it out. At this point, unplug the power supply. Remove the two pads from the frame and place all three parts into a container of warm, soapy water. Let them sit for a while until the dried ink has loosened, then gently scrub each piece. Let the pads and frame sit on a paper towel or newspaper until each is COMPLETELY dry. Place the pads back into the slots in the frame and reinstall the frame into its spot on the right side of the printer. Once you are finished, you will need to reset the error message. Power down and unplug the printer, then hold the power button down as you plug the power supply back in. Release the button and wait a few seconds. Hit the power button once more to reset the code. For other Canon printers, opening the lid of the machine requires tools for removing the plastic casing, springs and multiple screws. Consult your manual or Canon directly to find out which category your model fits into. This process is too involved to explain in simple text, as it involves a disassembly of almost the entire machine. Below is a video tutorial for printer owners that have to dismantle the machine to access the ink waste absorber pads. If this process seems too complex, it may be best to take your printer to a service center rather than attempt it yourself. Thank you so much! I will give this a try. 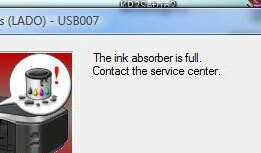 I was worried that I might need to buy a new printer when this error message popped up!